I finally got to try AVI Seabar and Chophouse inside the Broadview Hotel downtown. Brian went there a few weeks ago with some coworkers. He thought it was really good so he wanted me to try it too. We had the opportunity to have lunch together yesterday after his training class so that is where we went. 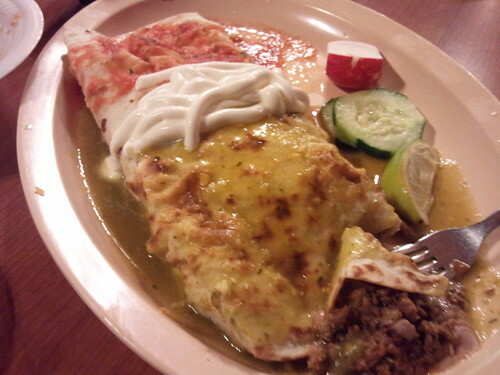 I’m so glad that I got to try it because it’s great food at a reasonable price. 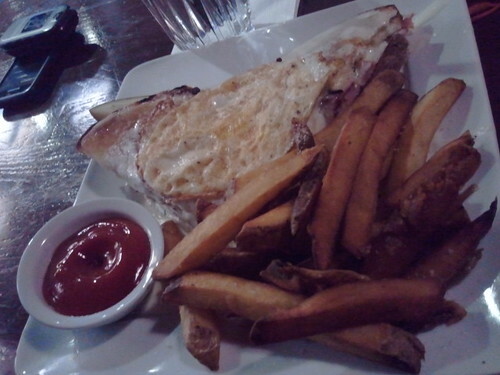 Brian got the croque madame ($8), which is like a ham sandwich with gravy and fried egg. He likes their fries with truffle oil too. Brian loves their fries, though I’m not a big fan. I had a few bites of the sandwich and loved it, though. I thought it was possibly one of the most delicious ham sandwiches I’d ever had. 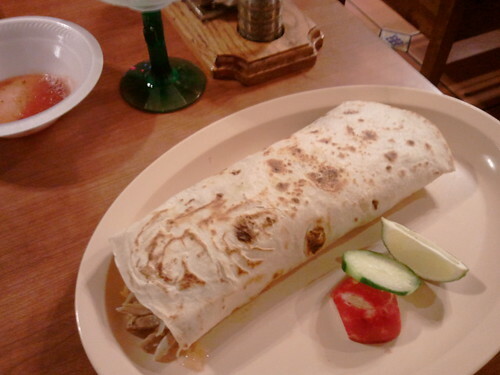 Although, I could feel the richness of it and could feel the thousands of calories permeate my system. 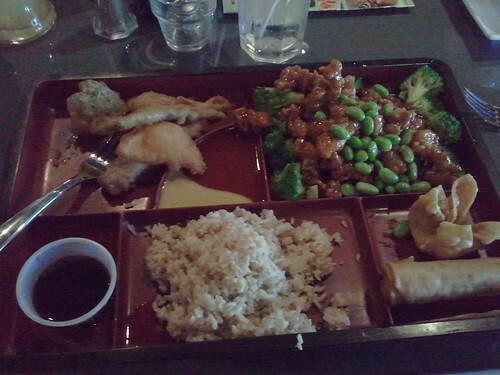 I can’t imagine eating that whole meal by myself, which is what Brian said he did the first time. He said he was miserable all afternoon as a result; but it was so good that he thought it was worth every single miserable calorie. LOL. 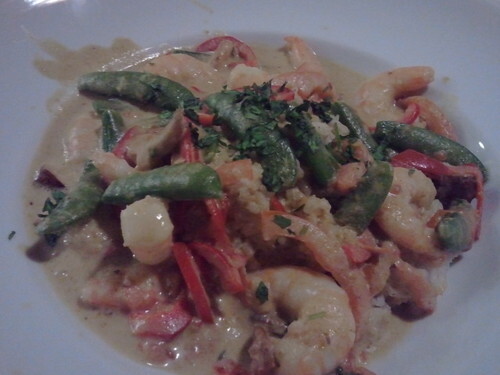 I ordered the coconut curry shrimp special ($8) which was really good, but also really spicy. They are serious about spicy foods in that kitchen. My mouth was on fire. The food was delicious, don’t get me wrong. I’m just a wimp when it comes to spicy foods. If you love spicy foods, I definitely recommend hitting AVI whenever they have the coconut curry shrimp special because you will love it. It’s the perfect blend of shrimp (big ones too, not those teeny tiny ones), shiitake mushrooms and snow peas (it looked snow peas, but I’m not really knowledgeable about veggies because I’m not typically a veggie eater; and I always confuse snow peas with string beans because they look a lot alike). I thought it also had some red pepper, tomato and potato. Everything worked well together and I actually liked the veggies and ate them. I would have finished the entire dish were it not for the inside of my mouth bursting into flames. LOL. Overall I really liked the look and feel and of the restaurant. The place is decorated like any other chophouse, but I liked the nice touches like the stone wall with the fireplace inset. I thought that was really neat. I liked that the booths were separated by tall walls so as to afford diners some privacy. I also liked that there’s an upper level. 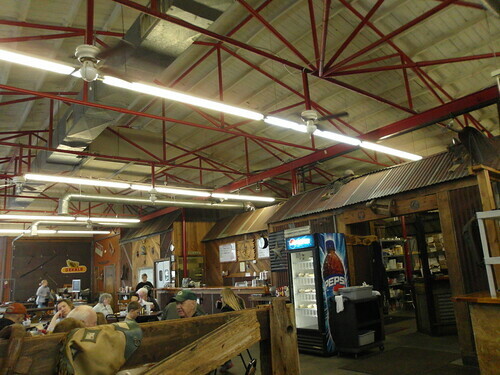 It looked like they situated the bar up there, which Brian thought was a great idea because he felt that the drunk people should be separated from people who want to actually eat and enjoy their food. I thought it was good, but then you run the risk of drunk people falling over the railing at the patrons down below. Brian was like, “That’s why they made the railings high. See?” I was like, “Well, the drunk people still have to stumble down the stairs. There’s plenty of opportunity for them to fall over.” Ha ha ha ha. We had an enjoyable lunch overall. 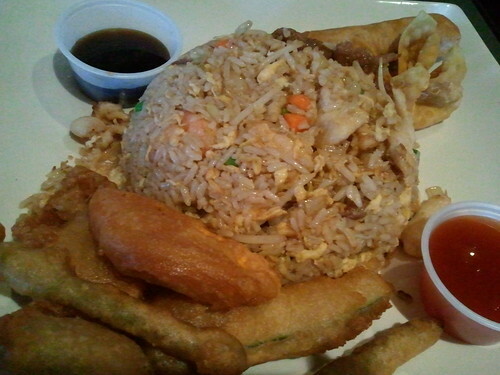 It felt special because we rarely ever eat out for lunch anymore. Back in the day, we used to go for lunch daily checking out various restaurants downtown. Nowadays I just have a shake at my desk and work over lunch. Brian does the same. I’m actually glad that we don’t eat out for lunch regularly because it saves us both money and calories, but it also makes those times when we do get to eat out for lunch more special. When you do something all the time, you start to take it for granted. 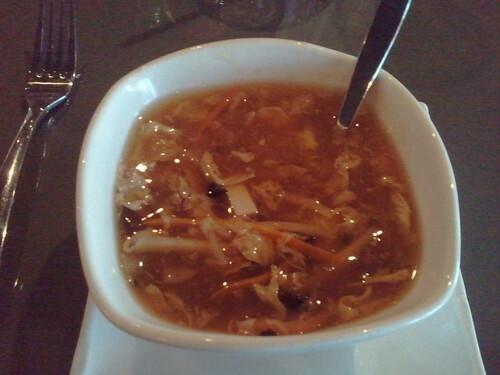 Thank you for taking me to AVI for lunch yesterday, baby! I really enjoyed it. Mwah! 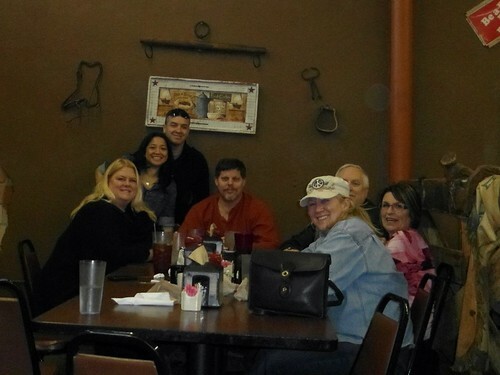 The day after cousin Tracy and Jeff’s wedding shower, we all met up at Lonesome Spur for breakfast. Cousin Tracy’s friend Lynn joined us also. 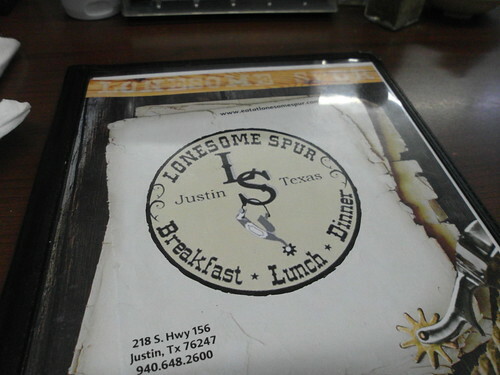 For those of you who don’t know, Lonesome Spur is located in the town of Justin, the boot capital of Texas. 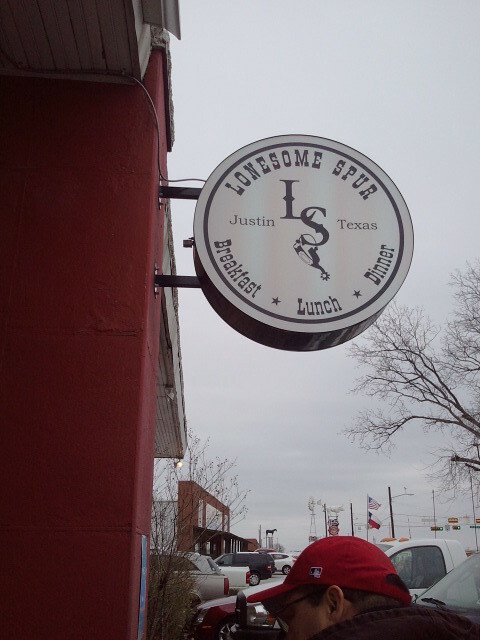 It’s the home of — yep, you got it — Justin boots. The discount warehouse was right next the restaurant. We actually saw it on the drive up and I got very excited. That is, until I found out that they’re closed on Sundays. Such is my luck. Ugh. I guess we’ll just have to make another trip back. 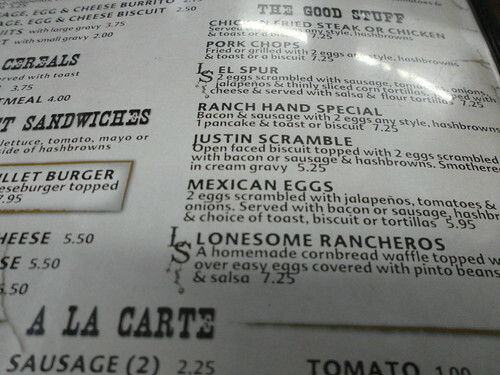 The food at Lonesome Spur actually wasn’t bad and the menu prices were quite reasonable. 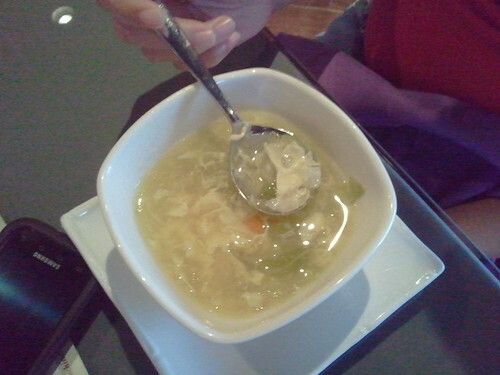 I wouldn’t mind eating there again. 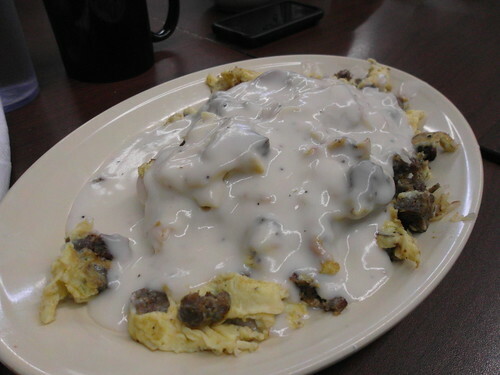 Brian had the Justin scramble, which is the exact same thing he gets at every breakfast joint or diner that we go to whether or not it is on the menu. 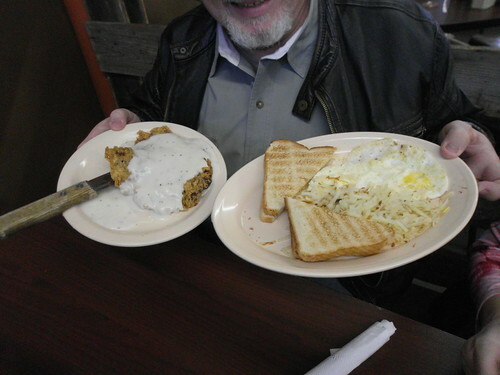 David had chicken fried steak, which doesn’t really look as impressive as other chicken fried steaks that I’ve seen or eaten. 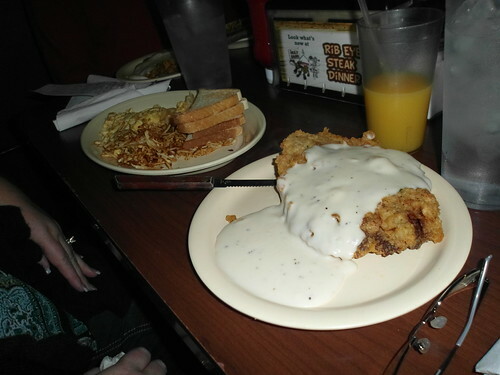 It looks like cousin Tracy had a bigger chicken fried steak. Hmmm? 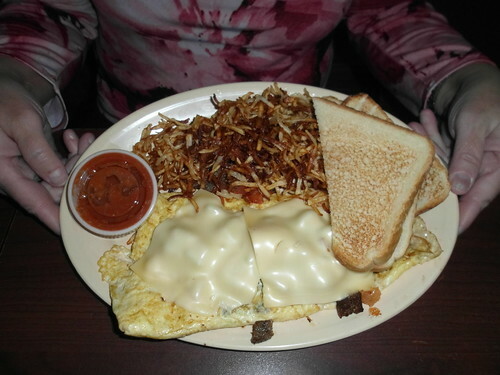 I ordered the cowboy omelet minus the veggies. The only thing I had them leave were the tomatoes. So basically it just had ham, sausage, bacon and tomato. LOL. 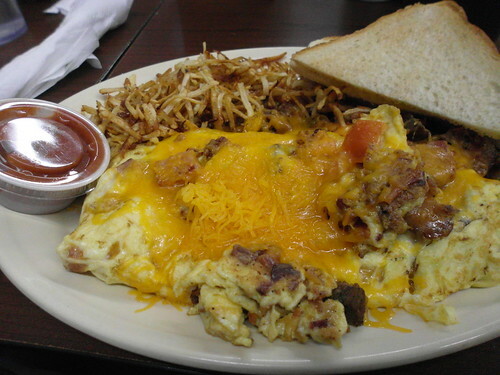 I really liked the extra crispy hashbrowns. That was a good call by cousin Tracy. 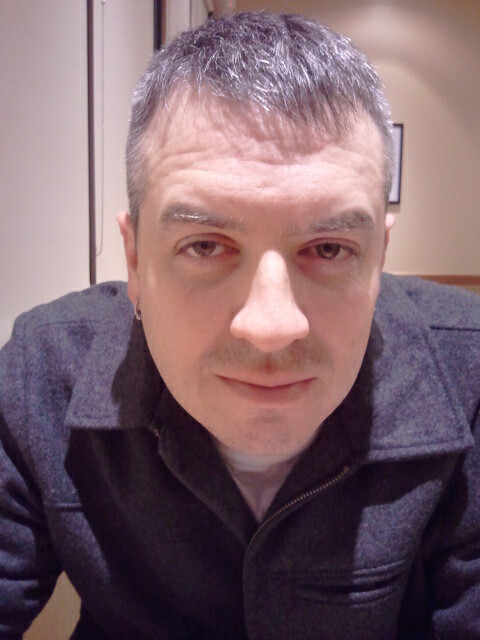 Brian and I went to eat dinner at Noodles & Co the other day. We were supposed to go to the gym, but Brian wasn’t feeling well. We also had some errands to run so I figured we could just do that and cross one more thing off our “to do” list. Besides, how could I say no to Brian? He’s so adorably handsome. Good looking people should always have their way. LOL. 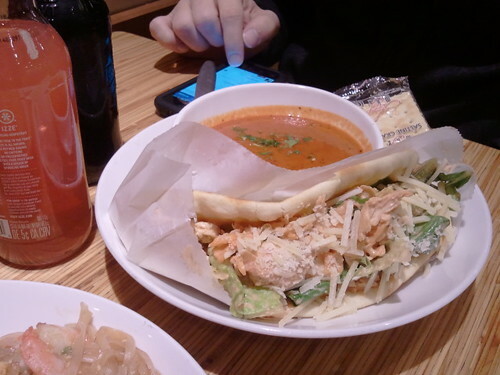 Brian got the chicken Caesar wrap with tomato bisque soup. It’s his most favorite thing to get at Noodles. I had shrimp pad thai. 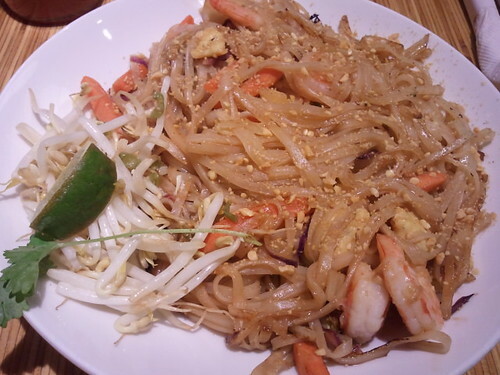 I like pad thai so that’s what I usually get there. Most of the time I get it with chicken. Decided to get shrimp this time, though; but I can’t remember why. I think maybe because I had chicken recently. We’ve been eating out way too much lately. At least the weight is staying off. 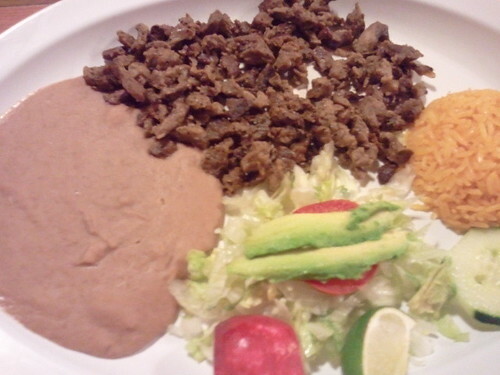 It was my first time at El Paisa. I’d never been there before. I’m actually glad I went. 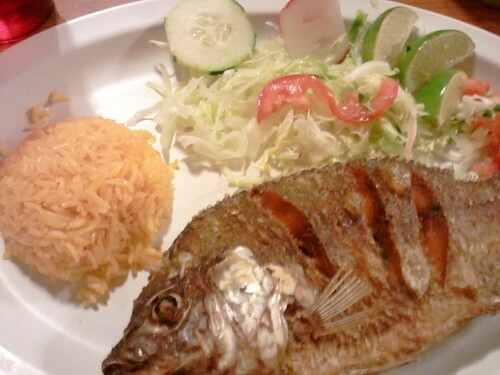 For one, I got to practice my Spanish a little and I found fried tilapia. It freaked Misty out a little, but it was yummy! It didn’t bother Brian because he’s used to seeing me eat fried tilapia from back in the day when we used to eat at Japan Express two or three times a week. LOL. 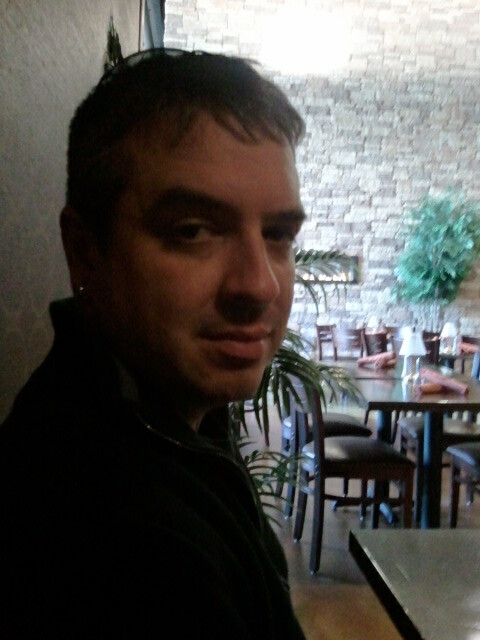 Brian and I decided to go to Oh Yeah China Bistro after paintball. It’s the first day of the month and we’re already breaking the rules. LOL. I can already tell October is going to be a bad month. Brian and I both had some pineapple lemonade, which he liked. It’s Brian’s first time there since they changed their name and started serving meat. We both liked the restaurant when it was Zen Vegetarian. I think he likes it even more now. Overall Brian gives Oh Yeah his seal of approval.